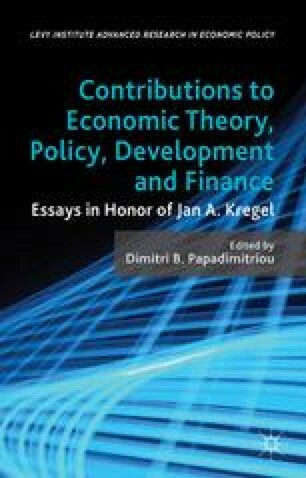 Few have contributed to the positive development of Post-Keynesian theory in scope, method, theory and policy as Jan Kregel. While the Post-Keynesian approach had unfortunately and mistakenly been identified as a medley unified by its critique of mainstream theory (Snowdon and Vane 2005), Kregel’s scholarship, unique among its peers, has demonstrated that it stands on its own merits and does not exist solely as a rejection of orthodoxy. From the Rate of Profit, Distrubution and Growth: Two Views (1971) and the Reconstruction of Political Economy (1973), to his seminal article with Eichner (1975) and his articulation of the effective demand approach to employment and inflation analysis (1985a), Kregel has reconstituted the Post-Keynesian paradigm as independent and distinctive. Kregel has not only masterfully integrated the contributions of Keynes, Robinson and the Cambridge school with those of their Classical Political Economy ancestors, like Smith, Ricardo and Marx, but he has himself been an intellectual pillar for much of modern Post-Keynesian thinking. His scholarship that spans five decades and hundreds of publications has also given us original reinterpretations of the works of Fisher, Keynes, Robinson, Minsky, Prebish and others. There is no other Post-Keynesian who has produced as many and wide-ranging rigorous, applied and sensible policy proposals on topics ranging from structural reforms for development (2004a), international financial reform (2000 and 2004b), European unification (1990a, 1990b, 1991), full employment policies for the Euro Zone (1999), bank regulations (for example, 2002), stabilization policies in Asia and Latin America and many other (1989, 1999, 2000, 2003).